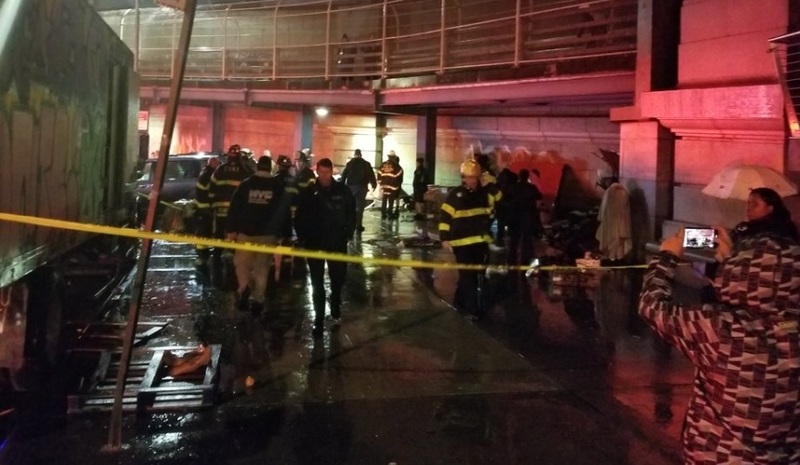 A driver plowed into a crowd of pedestrians in lower Manhattan Monday evening killing 1 and injuring another five people, according to officials. Police say a man was trying to parallel park his van when he hopped the curb and plowed into the crowd of pedestrians fatally striking at least one. Video from the scene shows extensive damage to the rear of the van and reports so far are saying it was an accident. Myles Miller reported on Twitter that the driver is at the scene speaking with NYPD investigators about the fatal crash. The FDNY began receiving reports that several people had been hit by a car at the intersection of Canal and Forsyth around 6:50 p.m.
An NYPD spokeswoman said one pedestrian was pronounced dead at the scene and another five victims were taken to hospitals. The condition of the five injured is currently unknown but police are on the scene investigating the crash. The NYPD warned there will be heavy delays in the area and told drivers to avoid the area near the Manhattan Bridge. The NYPD spokeswoman also said that the driver appeared to have lost control and jumped the curb while trying to park in reverse. More video from the scene shows an enormous emergency response to the area which has now been cordoned off by police. Emergency officials advised people to avoid the area "until further notice" as they investigate the crash. A similar crash occurred in May last year when a car plowed into a crowd of pedestrians killing one and injuring another 22 people in Times Square.